Next month, Paramount and Starry Eyes directing duo Kevin Kölsch and Dennis Widmyer will be unleashing an all-new remake/reimagining/readaptation of IT and The Dark Tower author Stephen King's Pet Sematary. Arguably King's scariest novel, Pet Sematary is all set to crawl out of the grave and into the night later this month when it hosts its World Premiere at this year's SXSW Film Festival on March 17th. The much-anticipated film then lurks into a theater near you on April 5, 2019. And to get you guys ready for its release, today we have two spooky new stills from the upcoming remake/readaptation featuring new Louis Creed played by Jason Clarke (Dawn of the Planet of the Apes, Terminator Genisys). 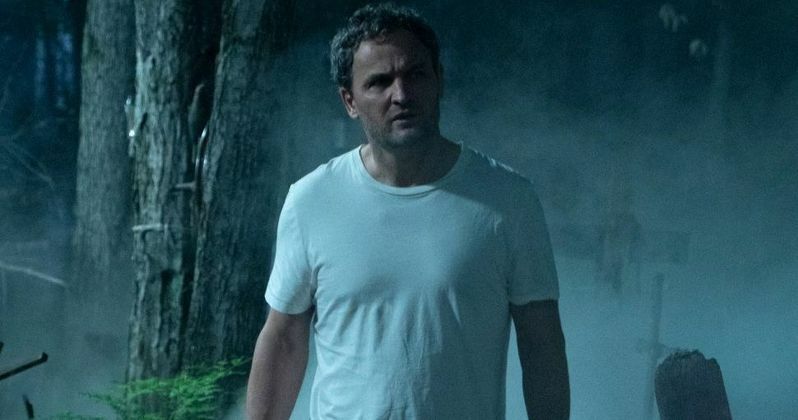 The first still features Jason Clarke wandering, in what appears to be his sleep, through the fog-covered titular cemetery in the middle of the dark woods. Those who have read the book and/or seen the original film know this scene well. Two words: Victor Pascow. The second still we have for you to check out today features Clarke once again. But this time the actor is standing in front of the infamous deadfall aka the barrier that separates the wholesome-ish Pet Sematary from the dark woods, the Wendigos, and the Micmac Burial Ground beyond. For those few film fans just getting to know the tale of Pet Sematary, the plot follows a family man and doctor named Louis Creed who relocates from Boston to rural Maine with his wife Rachel and their two young children, Ellie and Gage. No sooner do they settle into their new house when curious little Ellie discovers a mysterious burial ground hidden deep in the woods nearby. From there things get super-tragic, and Louis joins forces with his kindly old neighbor Jud Crandall to try and right the horrific event(s). As you might imagine, things don't go as planned, and the two men end up unleashing an unfathomable evil. Pet Sematary is of course based on Stephen King's 1983 horror novel, which was nominated for a World Fantasy Award for Best Novel in 1986. Director Mary Lambert has already adapted this tale of terror for the big screen in her 1989 version of the same name. The film stared Dale Midkiff as Louis Creed, Fred Gwynne as Jud Crandal, Denise Crosby as Rachel Creed, and Miko Hughes as little Gage Creed. This new version stars the above-mentioned Jason Clarke as new Louis Creed, along with Amy Seimetz as Rachel Creed, John Lithgow as Jud Crandall, Jeté Laurence as Ellie Creed, Hugo Lavoie and Lucas Lavoie as Gage Creed, Obssa Ahmed as Victor Pascow, and Alyssa Brooke Levine as the creeping, crawling nightmare known as Zelda Goldman. Kevin Kölsch and Dennis Widmyer (Starry Eyes) direct the film from a script that has been adapted for the screen by Midnight Meat Train and The Prodigy screenwriter Jeff Buhler. Lorenzo di Bonaventura Transformers, Steven Schneider (Paranormal Activity, Insidious), and Mark Vahradian (Jack Ryan: Shadow Recruit, Deepwater Horizon) produce. Once again, Pet Sematary will host its World Premiere at this years SXSW Film Festival on March 17th, before lurking into a theater near you on April 5th. These new poics come to us from the new issue of Total Film by way of Games Radar.